Polish Pottery Cow Creamer Pitcher On the Farm by Poughkeepsie Polish Pottery & More at Animal Backgrounds. MPN: COW-Ladybug. Hurry! Limited time offer. Offer valid only while supplies last. Offered is one beautiful Polish pottery Manufaktura creamer in the shape of a cheerful mooing cow. This cow is in a pattern featuring farm animals. Offered is one beautiful Polish pottery Manufaktura creamer in the shape of a cheerful mooing cow. This cow is in a pattern featuring farm animals. 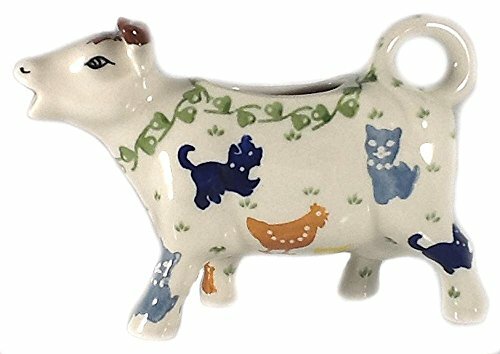 This charming cow measures 3.75" high, about 2.5" wide and 6" long from spout tip (her little mouth) to handle (her tail). She holds 2/3 cup (filled to the brim). You'll find lots of uses for this pretty cow. Perfect for cream for your coffee or tea. But also works well for thinner gravy, syrup or hot fudge. In the pattern "On the Farm" that features chickens, ducks, rabbits, dogs and cats. Fun for children at breakfast. 3.75" high, 2.5" wide and 6" long from spout tip to handle. If you have any questions about this product by Poughkeepsie Polish Pottery & More, contact us by completing and submitting the form below. If you are looking for a specif part number, please include it with your message.